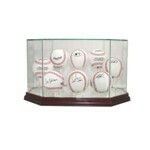 Single baseball acrylic display case with wood platform base and cherry finish. Features a round acrylic ball holder. Base is approx 4x2. Includes 1 free nameplate. 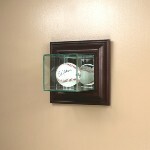 Single baseball wall mount acrylic display case with a walnut or black finish wood plaque. 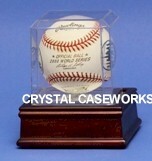 Acrylic single baseball display case with beveled edges and hard wood base and cherry finish. Also includes a mirrored floor. 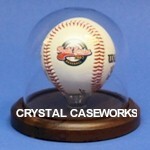 Single baseball acrylic display case with wood base trim choice. gold & black riser cases, but with a furniture grade wood base with a cherry finish. optically clear acrylic. 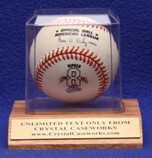 This is a high quality investment in the protection of your memorabilia collection. indentation to secure the ball. Door opens from bottom to the top (ball are not included). comes in your choice of wood finishes. Cherry, Walnut, Oak, or Black. 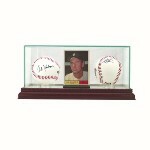 Single ball & card acrylic display case made of wood with cherry finish. protection of your collection. Price includes 1 free nameplate. indentations to secure balls. Door opens from bottom to the top (balls are not included). Includes up to 14 free nameplates. This cabinet has an installed lock with a set of keys. 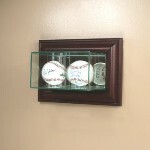 way to display your autographed or memorable baseballs or hockey pucks. Felt-lined background to create a stunning display. This unique cabinet holds 20 balls. fingers away, as well as dust! 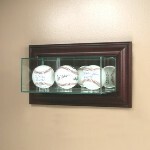 A great way to display your autographed or memorable baseballs. (balls are not included). Includes up to 23 free nameplates. 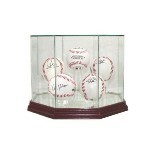 Our rectangle shaped baseball display case holds 12 regulation sized baseballs. cover and saw tooth wall mount hangers. Measures 19" x 15" x 3". Comes with up to 12 free nameplates. 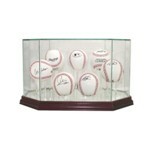 Our Home Plate shaped baseball display case holds 12 regulation sized baseballs. front cover and saw tooth wall mount hangers. Measures 19" x 19" x 3". Includes up to 43 free nameplates. easily slides into the display for background imagery. Photo & ball are not included. 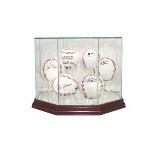 Single baseball acrylic display case with a wood platform base with black or cherry finish. Chicago Cubs winning the 2016 World Series. The riser base is made of red and blue acrylic matching the Cubbies team colors. The engraved name plate is white with red text and reads Chicago Cubs - 2016 World Series Champions. The optically clear acrylic cover holds an official 2016 WS Baseball and the BALL IS INCLUDED. YES, you get the display case and the ball. The ball sits on a custom made cup stand. This is a truly a 1 of a kind item. with a choice of walnut or black finish wood plaque. Single baseball & 5 x 7 vertical photo wall mount acrylic display case with a choice of walnut or black finish wood plaque. a choice of walnut or black finish wood plaque.